At colleges and universities across the country, the Movimiento Estudiantil de Chicanos de Aztlan (The Student Movement of Aztlan Chicanos) — better known by its acronym, MEChA — is calling for the surrender of wide swaths of American territory to Mexico. Worse yet, in doing so, it has the support of university administrators, elected officials, and — thanks to the mandatory student activity fees on which the organization depends — tuition-paying students. Founded in the late 1960s, MEChA has spent the last three decades indoctrinating Latino students on American campuses in the ideology of reconquista (reconquest). 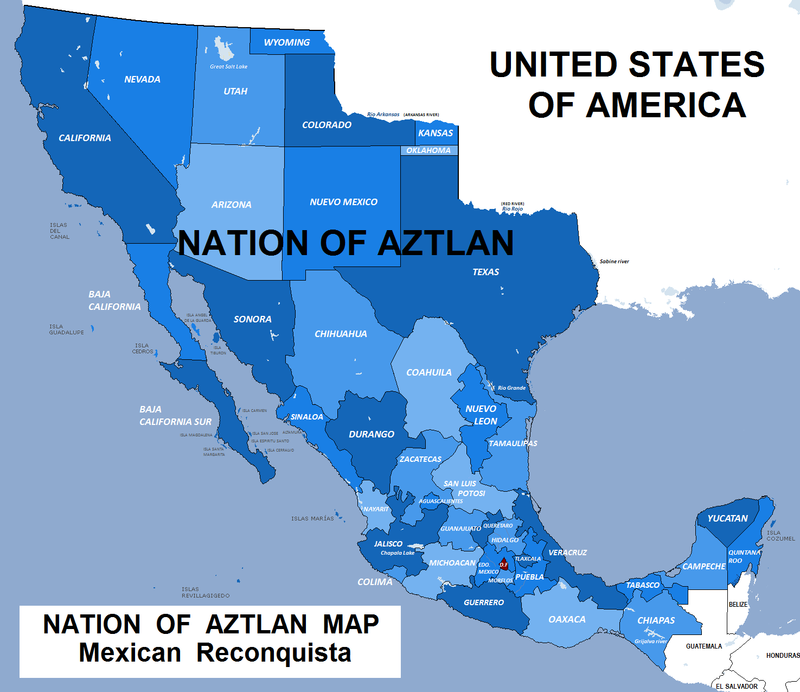 According to MEChA propaganda, the Southwestern United States — including California, Arizona, Texas, New Mexico, as well as parts of Nevada, Utah, and Colorado — sits on the territory of the ancient (and mythical) “Nation of Aztlan.” Supposedly the cradle of Aztec civilization, MEChA charges that Aztlan was unjustly seized by the United States following the Mexican-American War. Now MEChA wants this territory given back to its alleged rightful owners: the people and government of Mexico. By supporting continued high levels of Mexican immigration to the United States, MEChA hopes to achieve by sheer weight of numbers what the U.S. government long ago achieved by force of arms: the re-partition of the American Southwest. To this end, MEChA endorses a cocktail of pro-immigration policies. These include open borders, government benefits (including the right to vote and obtain drivers licenses) for non-citizens, amnesty for illegal aliens, dual citizenship, state recognition of Spanish as an official language, and racial set-asides in education and corporate hiring. El Plan Espiritual is typical, not just for its atrocious prose, but also for its violent racial overtones. Indeed, to judge by the numerous Web sites and student publications sponsored by MEChA, life after the reconquest is going to be a pretty dreary affair. Just beneath the surface of the Marxist-inspired “union of free pueblos” imagined by MEChA visionaries runs a rich vein of race hatred and conspiratorial anti-Semitism. As an editorial addressed to “capitalist whites” in the University of California Irvine’s La Voz Mestiza (The Mestiza Voice) concludes, “You’ve spilled enough of our blood, now it’s your turn to bleed you [expletive] sub-human beasts.” Or, as one of MEChA’s many charming slogans has it, “por la Raza todo; fuera la Raza nada”: for those of our race, everything; for those outside of it, nothing. This entry was posted on May 5, 2012 at 5:36 am	and is filed under Immigration, International, Myths Busted, Racism. Tagged: Family, Immigration, Left, Life, Mexico, News, Politics. You can follow any responses to this entry through the RSS 2.0 feed. You can leave a response, or trackback from your own site.